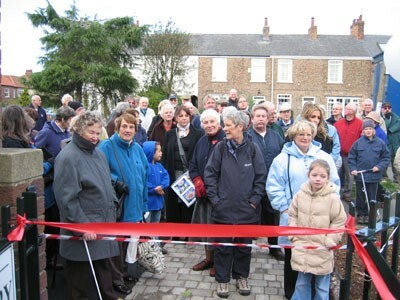 Saturday 11th November 2006 saw the opening of the new Sensory Garden next to the Library in Bishopthorpe Main Street. Watched by over one hundred people, Geoff Dixon, 90, the well known local butcher, cut the ceremonial tape. He was then accompanied into the garden by two of the younger residents of the village, 6 year old Max Jones and three year old Mai Harris. 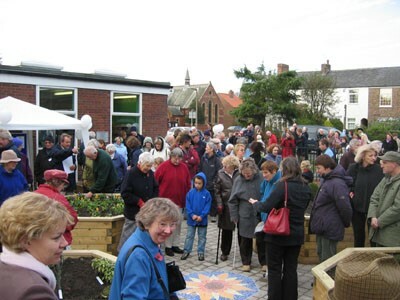 As people moved for the first time into the new garden (leased from the Library Service for seven years), to look at the layout and the plants, Bishopthorpe Millennium Trust Chair John Bettridge spoke about the development of the garden and its place in the Bishopthorpe@Crossroads improvement scheme. Geoff Freeston of Brunswick Organic Nursery then told his audience about how the design of the garden was influenced by the need to provide sensory stimulation and access for all – and provides a community owned and run facility. 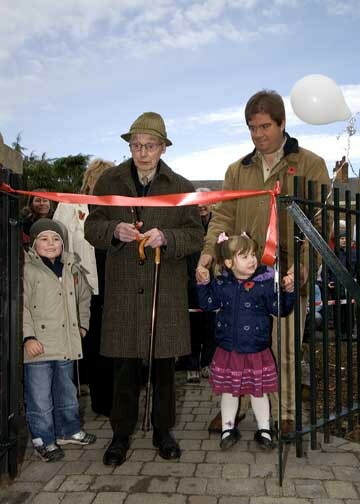 The opening ceremony concluded with the switching on of the water feature and lights by Alfred grandson of Mrs Spooner who used to live in School Lane, and to whom the water feature was dedicated by her family. Also on hand were some of the people from Vernon House day centre who had created the sunflower mosaic at the centre of the garden, workers from Brunswick, Parish Councillors and Trustees, our local councillor and City of York representatives. And of course volunteers and residents of Bishopthorpe. 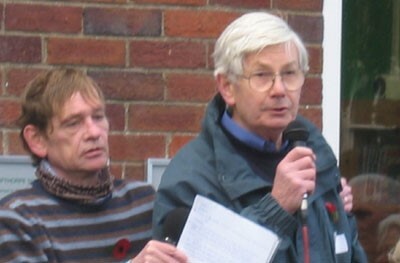 Music and the PA were provided by Brian Ross-Williams, and a display was on hand to tell the story of the Crossroads scheme. The garden will be unlocked and open every day during daylight hours. A display about the scheme is on show at the Library for the next three weeks. A series of photographs of the opening event can be found at simonmeltonphotography.com from where prints can be ordered.